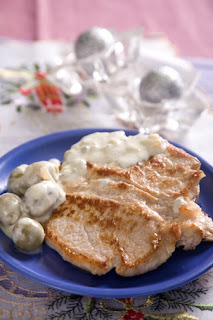 A sliced pork fillet with sauce of sour cream, blue cheese and green olives is a great dish for your romantic dinner with your soul mate. It goes perfectly well with a bottle of red wine. 1. Chop the onion and fry it with the glove. Spice with salt, pepper and cumin and add the sliced pork fillet. Cover it with water and cook it gently for about 30 minutes in the covered frying pan. 2. Next put the pork chops aside and on the same pan put olives and the blue cheese, then add the cream, the butter and the wine. Stir well and cook it for 10 minutes. 3. Serve pork chops with the sauce and garnish with caramelized carrots.